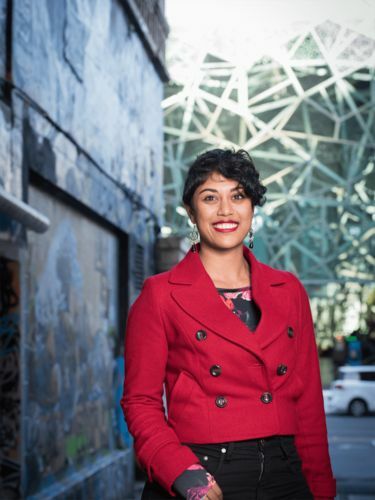 Master of Social Policy graduate Mishma Kumar is driven to make a difference. Day-to-day she supports people affected by drug and alcohol issues and finds the time to contribute to state-wide public policy. Mishma Kumar is a big believer in a four-day work week. "We've lost the ability to just be," the Master of Social Policy graduate says. "There's an anxiety about having to do everything, to be brilliant. I just want to be in my twenties and enjoying them." How she spends that day away from the workplace changes: one week she might binge Doctor Who, the next she might spend time setting up Project Sahan, an organisation aiming to work with young people in school to build their emotional recognition and regulation tools. The point is that she's doing it on her terms. That creativity has flow-on effects for her career in the drug and alcohol sector. She currently works as a Senior Drug and Alcohol Clinician at Odyssey House Victoria, an organisation that works with people affected by drug and alcohol issues. Earlier this year, she helped formulate a policy paper at the Victorian Alcohol and Drug Association (VAADA), analysing how to marry the perspectives of the justice system and the drug and alcohol system. "The drug and alcohol system looks at clients from a strength based perspective," she says. "We see how we can best support clients to meet their individual goals. The justice system however takes a deficit perspective: 'they've gone wrong and need to be punished'. How do we marry the two?" She was thinking through these issues while also working as a drug and alcohol clinician at a crisis shelter for homeless men in Melbourne. "Working with clients you can see change almost instantly. They're often able to gain insights into their behaviour in a few sessions. Even when it's not immediate, you know that you've sown the seeds for change later in life." In contrast, the policy world is all about incremental changes. They're quite different spaces to work in, but Mish says that tackling our society's major problems requires creative thinking. "The major problems we face are no longer isolated. We need to look at them from a holistic perspective," she says. "Let's find really creative solutions." She is passionate about the variety of work on offer in the drug and alcohol sector. There are jobs in everything from frontline care to policymaking. "The sector really values lived experience," Mishma says. "It's about human beings looking for help from other human beings. You learn how to just show up and be empathetic."